The Subscale Research Lab at NASA’s Armstrong Flight Research Center in California recently introduced a new addition to their fleet of miniature aircraft. The not-so-small MicroCub is a Bill Hempel 60-percent-scale super cub, modified by Armstrong to support engineering campaigns focused on the integration of Unmanned Aircraft Systems into the National Airspace System. 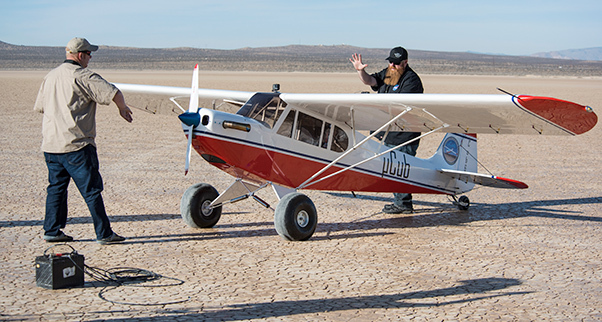 On Jan. 18, 2018, Armstrong’s Subscale Research Lab team piloted the MicroCub for its inaugural flight, successfully demonstrating the aircraft’s airworthiness. 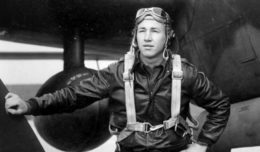 This initial flight was intended to check the ground handling and flight characteristics of the aircraft, along with validating the Command and Control system, verifying the “remote control only” mechanism, setting the tuning for autopilot gain, performing engine runs, gauging fuel consumption and testing stall speed. Though small in size, the MicroCub is a powerful vehicle in the realm of small to midsize UAS aircraft. Specifications of the vehicle include a 21-foot wingspan, a Piccolo Autopilot guidance system and a JetCat SPT-15 Turboprop–a design only model aircraft fanatics could dream up! The successful maiden flight means the MicroCub will undergo additional aircraft modifications to validate risk reduction technology. Eventually, this technology will be integrated onto other NASA UAS aircraft, such as NASA Ames’ Sensor Integrated Environmental Remote Research Aircraft, SIERRA-B. Crew members of the Subscale Research Lab at NASA’s Armstrong Flight Research Center in California perform a series of preflight system checks of the MicroCub to ensure the aircraft is ready for its maiden flight. “In addition to helping with UAS integration into the NAS efforts, the MicroCub is a configurable aircraft that can be modified and utilized for a variety of flight tests at NASA,” said Justin Hall, an Armstrong operations engineer and UAS pilot. Since the initial flight in January, the Armstrong crew has since installed an onboard smoke system–a see-and-avoid tool that can be used for visual identification of the aircraft, ensuring that small to midsize UAS are detectable by other aircraft during flight. By testing this technology on the MicroCub first, NASA can record VID data during test flight encounters, which will help researchers understand just how visible small UAS aircraft, like SIERRA-B, are from a variety of distances, without the risk or high cost that comes with testing such a technology on larger UAS like NASA’s Ikhana Predator B.
MicroCub’s small but versatile design offers a lower-cost solution to validate one-off airframe designs, further define requirements for UAS technologies, integrate payloads, contribute to risk reduction and airworthiness tests, prove autonomous technology capabilities, and achieve a variety of other UAS-NAS related objectives. The MicroCub is just one small step in familiarizing the public with a tangible representation of what the future of unmanned flight could look like in the sky above them. As NASA expands its research and development of small unmanned aircraft vehicles, the MicroCub will continue to support UAS efforts that will ultimately change and redefine UAS flight in the future.